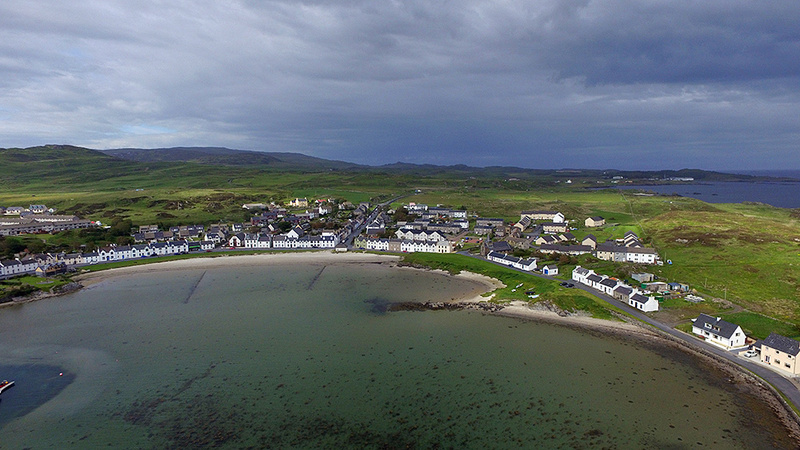 One of Islay’s largest villages, Port Ellen, seen from the air. Frederick Crescent stretches around the shore of Loch Leòdamais, lit up by the Sun breaking through the clouds. Lennox Street turns off it leading east towards the three southern distilleries. One of them is visible in the distance on the right, Laphroaig distillery. This entry was posted in Beaches, Cloudy Weather, Distilleries, Islay from the air, Landscape, New Post, Sea Loch, Sunny Weather, Village and tagged Islay, Laphroaig, Loch Leodamais, Port Ellen by Armin Grewe. Bookmark the permalink.